I got an email this morning from my ex-colleague. I was doubtful at first since it say's it's a freebie from Delifrance. Hmm...really??? Curiosity got the best of me so I decided to check the link and see for myself. Voila! 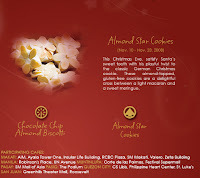 Indeed it was a legit site and they are giving away free Almond Star Cookies (well that was the choice of the sender for me). I think it was a new product and this is their way of marketing it. Apart from the cookies, there is another option which is the Chocolate Chip Almond Biscotti. You just have to select it as the treat to be given away to your friends.